A day late, but Happy New Year and best wishes for the year ahead. 2011 was a year of great change across the globe and anxiety for many (especially for us folks in Europe!). Some commentators have suggested that it is a year to forget. I disagree. In many ways we should be thankful that 2011 is over, but we should not forget the events that defined it. The Tsunami in Japan whose effect will be felt for future generations. The Arab Spring where successive totalitarian governments were toppled like Dominoes. The killing of Osama Bin Laden. The continuing Euro crisis that will almost certainly never be resolved fully – I smell a Heath Robinson half-baked euro-bodge-solution in the coming months. These are just some of the events that have profoundly reshaped the world we live in. I suspect that in the future, 2011 will be viewed as the turning point where the world truly started to become less West-centric. The economic emergence of the BRIC nations at the time of the decline of the European block has all but ensured that this scenario will come true. Every year has defining events. 2011 stands out due to the sheer and almost incessant number of events, spread out across the world affecting a significant proportion of the global population. Here’s to hoping that 2012 will be a great year. This entry was posted in Odds and Sods on 2 January 2012 by Alexander John. We’ve moved! And just to add some extra confusion, we’ve changed our name as well! Well, at least this blog has. First, the change of location. As I’m now doing work for companies other than Whiteleaf Networks, I’ve moved this personal blog outside of its’ domain and nominal purview*. Although future posts may touch on work done with Whiteleaf Networks or any other company, they will neither be official or approved. Changing the name is mostly about appearance and perception. The original name of CrossNotes was a vague pun on the origin of the name Whiteleaf Networks (if you don’t know, above the village of Whiteleaf there is a large cross cut into the chalk hillside). However, it does give the impression that I’m always slightly miffed at the world or life in general (which I don’t think I am). Also, as this blog is becoming a little more personal, it does make sense to stick my name at the top. So what is to come? I’ll be expanding the subject matter to include web design & development and perhaps a few more esoteric topics. I do have some IT posts in the works including an updated version of a powershell script to automate the backups of Hyper-V Virtual Machines. This entry was posted in Odds and Sods on 29 October 2011 by Alexander John. When I built my HTPC earlier this year, I replaced the elderly graphics card within the old chassis I was using with an ASUS 4350. I don’t pretend to be anywhere near an expert on graphics cards, but the limited research I did led me to believe that this card would be ideal. Relatively cheap, passively cooled and delivered full HD via HDMI. What I did not know then, but what I discovered following installation, is that this card does not output sound via HDMI without some driver jiggery-pokery. You would see a message similar to this one in the Sound properties dialog within Windows. In short, neither the supplier driver nor the updated Catalyst drivers from AMD/ATI include the relevant Realtek audio driver. 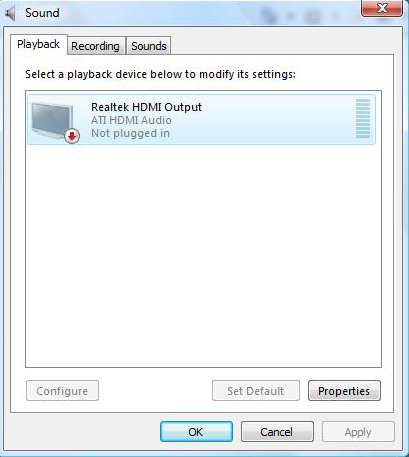 The solution is relatively simple: you download and install the latest HDMI audio driver from Realtek. 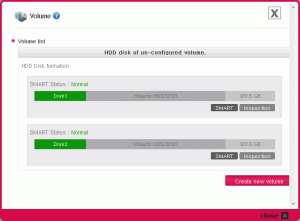 This is what I did earlier this year and my HTPC worked without a hitch until I mistakenly updated the AMD/ATI Catalyst drivers through Microsoft Update which promptly broke it. Needless to say, I hadn’t written down how to get this working so I had to find out all over again from scratch. Disclaimer: It is not generally recommended to download and install drivers directly from OEMs. Your first port of call should be the company that manufacturered the product you are using (in this case ASUS). If you follow these steps, you are doing so entirely at your own risk. Go to Realtek’ High Definition downloads site (http://www.realtek.com.tw/downloads/downloadsCheck.aspx?Langid=1&PNid=14&PFid=24&Level=4&Conn=3&DownTypeID=3&GetDown=false). Check/tick the option Iaccept to the above and then click on the Next button. Scroll down the list ofWindows drivers until you find the entry ATI HDMI Audio Device (it will be in red text). Click on one of the three download links to the right to download the driver. 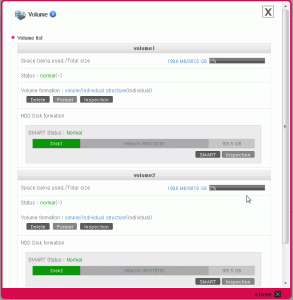 The downloads are FTP transactions that can take upto several minutes to stat. So don’t worry if nothing happens immediately. Once downloaded, install the driver. You should be prompted to restart your computer once completed, if not, do so anyway. Upon restart, sound may still appear to be disabled. The trick here is to pull out the HDMI connection and then replace it. Once this is done, the HDMI sound connection should be detected and work. The moral of this particular story: Sometimes, it is necessary to document things you do with your home systems. This entry was posted in HTPC, IT, Windows on 5 August 2011 by Alexander John.